In 2010 the New Zealand Walking Access Commission worked closely with geospatial solutions developers Geographic Business Solutions (GBS) to create the Walking Access Mapping System (WAMS) – an interactive web-accessed map that shows Kiwis exactly where they have access. 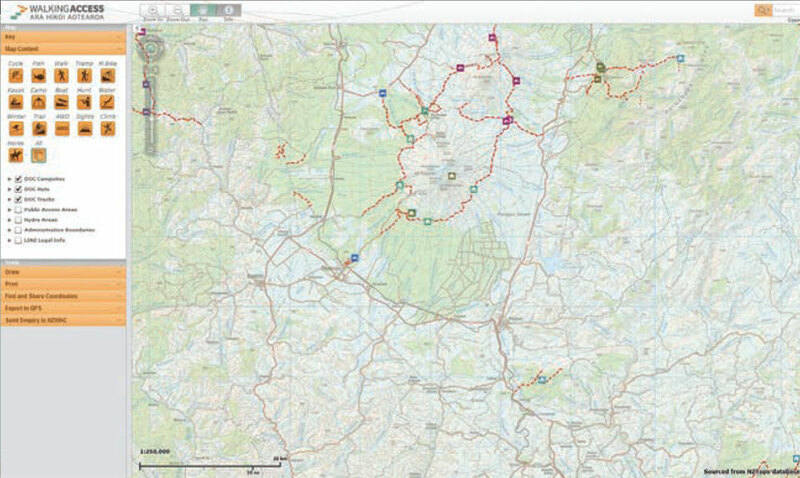 Recently, an enhanced version of the mapping system went live. The new version allows approved partners to add useful information to the map, such as hiking trails, fishing spots, gateways, mountain biking trails, campsites, lookout points and much more. Established in 2008, the New Zealand Walking Access Commission is a Crown entity that exists to enhance public access to New Zealand’s magnificent outdoors. More than a third of the country is available for public access, but until recently finding out exactly where you can walk wasn’t easy. The Commission was created by the Walking Access Act 2008, with the purpose of providing the New Zealand public with ‘free, certain, enduring and practical’ walking access to the outdoors. One of the Commission’s first tasks was to develop an online map that lets any one – domestic or international – see where they can walk in New Zealand. Developed by geospatial software specialists GBS and known as the Walking Access Mapping System, the first version of the tool went live in test mode in December 2010, then officially launched in July 2011. Although it hasn’t been promoted widely, the mapping system had more than 90,000 visitors in the financial year ending July 2012. That’s an average of 250 visits a day. The tool works with data supplied by Terralink International Ltd, a major provider of land and property data. When it was launched, the Walking Access Mapping System was unique in the world. It combined cadastral (public record) data with topographical data and aerial imaging on one website-hosted map, which meant mixing and matching public and private information. Users could see at a glance if land was public or private. “As you’d expect, the Walking Access Mapping System is being used by recreational groups and the public generally. But it also has commercial and government users – property and forestry businesses, for example. They can use it to calculate land area, because the data in the mapping system is very accurate. New Zealand has a Torrens-based land data system, which is also used in the Philippines, Thailand and Malaysia, Australian states, some Canadian Provinces, some states in the United States and other places where the British flag once flew”, said New Zealand Walking Access Commission Chief Executive Mark Neeson. In early 2012, six months after the launch of the Walking Access Mapping System, the Commission conducted a survey of users to gauge the success of the project. An extremely convincing 97% of people said it was useful, and the same percentage said they’d recommend it to friends and colleagues. At the same time, they made it clear that they wanted more. When a mapping system user has a question or encounters an issue concerning public access, they can use the site to notify the New Zealand Walking Access Commission. Harley Prowse explains the various components that make up the Walking Access Mapping System. So if you’re contemplating a fishing expedition on the Rangitikei River, the Walking Access Mapping System has the potential to pinpoint all the things you need – campsites, huts, fishing spots, cycling tracks, walking tracks, historic places of interest and more. If you’re within mobile range, you can access all this data through your smartphone. The look and feel of the mapping system has also been upgraded with the new version. The map occupies more of the screen and the side bar can slide away with a click. There’s also a handy set of drawing tools, so that you can plan an excursion complete with way points and text comments. Plus users can export GPS information into any GBS-enabled device, to guide them during their expedition. From a tourism perspective, both domestic and international, the Walking Access Mapping System broadens the horizon for adventure. The mapping system also gives users the facility to make enquiries direct to the Commission about access or report problems. “Users can draw lines on the map, annotate, attach photos and even copy newspaper reports, then send them all to us. We’ll take up the case and keep them informed”, said Cullinane.